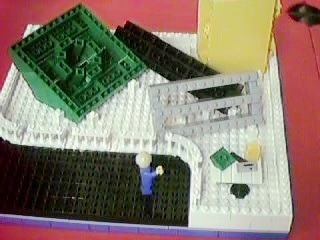 "The Museum of the Excessively Huge" is the name of my entry in the Builder's Expo LEGO® model exhibit that took place at The Construction Site in August and September 1999. The Builder's Expo was not a competition. In case you're having trouble figuring out what this is: It's a minifig (a little LEGO® "person") in a modern art museum looking at some sculptures which are actually giant LEGO® bricks made out of LEGO bricks. The giant bricks are 6 times normal size (or 216 times, if you count width x length x height). There are four giant bricks  a 2x2 green double-slope roof piece, a 1x2 yellow brick, a 1x2 gray tile with grille, and a #3 Technic cross axle. The red around the edges in the first two photos is just a countertop. To aid the museum visitor, a miniature replica of the giant sculpture is presented on a table to the side. The miniature pieces (which are just normal actual-size LEGO® bricks) are arranged in the same arrangement as their large counterparts. 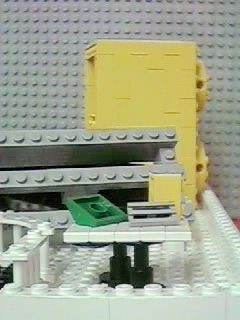 From left to right across the top: The 2x2 green roof piece, the black #3 Technic cross axle, and the 1x2 yellow brick. The 1x2 gray tile with grille is resting on the cross axle. In this picture, the large green object in the background is a large 2x2 double-slope green roof brick, and the large gray object is a 1x2 tile with grille. This picture shows the 1x2 grille tile again and the large yellow 1x2 brick. For this photo I used a large gray baseplate as a background to reduce clutter in the photo. Minifigs like Microdave are about 1/40 the height of real people. 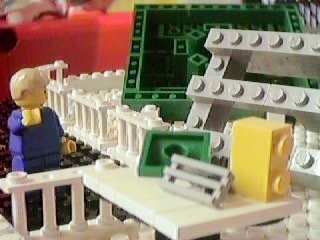 Based on a scale of 1:40, the actual LEGO bricks on the table would be 40 times normal size (from Microdave's point of view) and the large bricks would be 240 times normal size. In terms of volume, the large bricks would be 240 x 240 x 240 = 13,824,000 times normal size! The large bricks do not completely fit each other in the same ways that their actual-size counterparts do  some combinations work and others don't. The combinations that don't work result mainly from the extra thickness added by the studs ("bumps"), a problem that could be solved with lots of tiles (the smooth thin LEGO® bricks). Unfortunately, tiles are fairly rare and I didn't have nearly enough to eliminate the studs in these models.